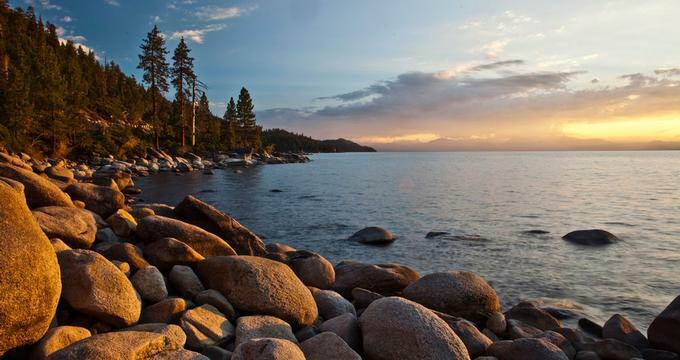 Lake Tahoe is a popular weekend destination on the West Coast, offering fun outdoor adventures, romantic views and a diverse choice of accommodations, ranging from luxury to budget. South Lake Tahoe is home to lively nightlife, casino hotels on the Nevada side, and boutique shopping at Heavenly Village on the California side. The West and the North Shore offer beautiful nature, outdoor activities and scenic lake beaches. Nestled in Donner Pass, Clair Tappaan Lodge is a historic property offering hostel-style lodging for adventure enthusiasts craving a mountain retreat. This is a perfect option for the budget adventurer seeking a home base close to lake and mountain activities. Guests are less than 25 miles away from all Lake Tahoe has to offer. The atmosphere of the lodge is casual, with comfortable communal spaces accommodating up to 145 guests. Rooming options include single-gender dorms, two-person rooms, and family rooms with twin-sized bunk beds for groups traveling together. Single bathrooms are not available, but the men’s and women’s communal bathrooms have been recently remodeled. Meal plans can be included; healthy, hearty breakfasts and dinners are prepared daily in the professional kitchen. Packed lunch stations are available each morning. Located mid-mountain at the Northstar ski area, The Ritz-Carlton of Lake Tahoe is a rustic escape with upscale furnishings, massive fireplaces, and picturesque views. This resort offers fun, adventure and relaxation in a mountain setting. During the summer, guests are steps away from hiking, mountain biking and fly fishing and only fifteen minutes from water sports at Lake Tahoe. In the winter, skiers can take advantage of the resort’s direct access to slopes or hop on the intermountain gondola. The hotel spa provides a menu of options for guests to relax, restore and rejuvenate, and children’s activities take place daily. At the end of each day, the Marshmologist will be at the fire pit creating cocktails for the adults and s’mores for everyone. With a focus on culinary education and outdoor exploration, the Cedar House Sport Hotel is a South Lake Tahoe destination for those seeking adventures in nature. This family-owned boutique hotel is a hub for winter and summer mountain lake activities. The stylish decor complements the natural elements of South Lake Tahoe. The hotel is in a sustainable, environmentally-friendly building, and the rooms’ furnishings provide a relaxed ambience. The single, queen, king and luxury suites all come with amenities like Keurig coffee makers, in-room refrigerators, docking station radios and free wifi access. The popular Stella Culinary School offers hands-on experiences, cooking classes, and “Create Your Evening” personalized dining options. Rooms start at $180 per night. Secrets Inn is a couples-only hotel located in South Lake Tahoe. The Inn provides a romantic getaway experience and access to year-around activities at the lake and mountain. Secrets Inn is in walking distance of beaches, shops, casinos, restaurants and the Heavenly Gondola, so couples can enjoy exploring the area together. With spectacular views of South Lake Tahoe, the property has 22 spacious mountain suites designed for relaxation and romance. Dedicated to providing a romantic stay for couples, all rooms include jetted tubs, walk-in showers, fireplaces, complimentary wifi, and no noise until after noon. Secrets Inn offers romance and wine & cheese packages for an extra surprise during a stay, and the hotel also provides beach items, including coolers, beach toys, chairs and towels, for guests to use while spending the day at the beach. Located directly across from the lake in South Lake Tahoe, the POSTMARC Hotel and Spa Suites encourages guests to find adventure during their stay. Seasonal activities include kayaking, paddle boarding, biking, fly fishing, hiking and skiing, all available within close proximity. The POSTMARC is a charming boutique hotel recently renovated to provide a more comfortable stay for travelers. Every room is equipped with unique features and modern amenities. Guests can choose from a variety of themed rooms including the 444-square-foot Watermarc King, whose spa theme includes a wet room, or the 584-square-foot Caesar’s Indulgence, with a hunting lodge motif and a 7-foot spa. The POSTMARC provides a relaxing vacation amid the natural beauty of South Lake Tahoe. 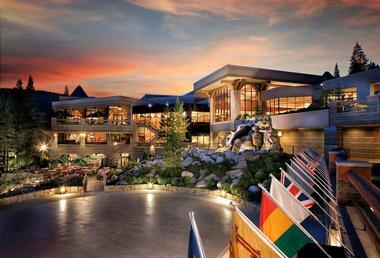 More vacation ideas: The Landing Resort and Spa, Lake Tahoe and Basecamp Tahoe City. Nestled in the mountains in South Lake Tahoe and surrounded by beaches, slopes, shopping and restaurants, the Avalon Lodge is an inviting upscale hotel making guests’ winter and summer adventures an elegant experience. The rooms in this boutique hotel are designed to provide comfort. Amenities such as a flat panel TV, iPod docking station, coffee press and free wireless internet access are included. Four-legged family members will feel welcome as the property is dog-friendly, providing treats at check-in. The 24-hour on-site Market Cafe sells gift items, healthy goodies, chocolates, and champagne and will deliver morning mimosas to guests’ rooms. The staff will answer questions and make recommendations for activities in the area. The Avalon Lodge provides bikes for guests to enjoy during their stay. The heated pool and fire pit are perfect spots to relax and admire the beautiful view. Located in the historic town of Genoa, Nevada in the foothills of the Sierra Nevada Mountains, David Walley’s Hot Springs Resort is a traditional lodge out of 1862 with modern conveniences and amenities. Close to Lake Tahoe, Reno and Carson City, this resort is a relaxing retreat with five hot spring pools and a full-service spa. A great choice for a family vacation, David Walley’s Hot Springs has spacious accommodations: one- and two-bedroom suites with fireplaces, balconies, and full or partial kitchens. The resort includes a laundry room, fitness center, business center, and playground. Billiards, horseshoes and badminton provide the opportunity for lively family fun, and free wifi hotspots are available throughout the property. The on-site Historic 1862 Restaurant and Saloon offers casual Southwestern cuisine and wild game. Located in Carson Valley, California, the Ridge is a beautiful 11-acre resort with 302 rooms and suites. Guests can use the complimentary shuttle service to take a five-minute ride into Lake Tahoe. One- and two-bedroom Condominium Suites include full kitchens, fireplaces, microwaves and refrigerators. At the Ridge Club Marketplace, guests can stock up on groceries, apparel, and ski-lift tickets. Adventure and fun are available year-round at the Ridge Resorts. During the winter, there is direct access to Heavenly Resort’s Stagecoach Chairlift. When summer rolls around, warm-weather activities such as tennis, hiking, and rock-wall climbing are available. Access to the health club, pools and indoor sports complex is complimentary, and Elevations Spa at the Ridge can provide a serene, blissful massage, treatment or facial.